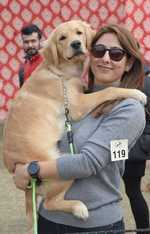 Squeals of delight, some bow wow, little pomp and some show, Sunday afternoon was a delight for pet lovers in Panchkula. While some disciplined dogs pulled out a flawless demo; there were naughty puppies rather happy checking out their mates. A doting pet parent making her Shih Tzu called Selfie have a sip of water on a sunny day in a bottle cap to a sturdy bully dragging two of his masters right outside the Pet Show, were sure a sight to behold! While the demos had people click and snap pretty pooches, the few stalls had decent footfall too. One had a gentle golden retriever enjoying her grooming session while taking short naps in between all that pampering. It was the bond between pets and their ‘parents’ that was hard to miss whether it was an instruction conveyed in a strong, tough tone or sweet nothings whispered in the ears to help them keep calm as random strangers came clicking selfies. Jumbo, a Chow Chow, was the cynosure of all eyes. Abjinder Sangha kept handling demands for selfies and stroking this rather majestic two-year old. Jumbo was all too well behaved through it all. 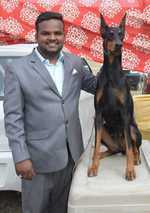 Proud of his pooch, this agriculturist from Gwara, Malerkotla does everything for his precious, including twice a day walk sessions. “It’s only with Jumbo that I realised the healing power of selfless love,” he said. Mr Frodo was another show stealer who with his overtly affectionate ways kept winning hearts. This one-year-old husky gets the name from his parent Gaurav’s favourite flick Lord of the Rings. St. Bernards Sky and Joy had their own share of attention. Ambar handling all that with her hubby Amit shared with us how positive and happy they make her. Totally into pets, she admitted on the side that her favourite Tara, a Labrador, wasn’t with them for this outing for usko nazar jaldi lag jati hai . 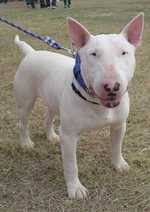 Not as fierce as Kiwi is Sultan, a Bull Terrier who drew strange looks all day for his half rat, half pig kind of look. But gentle he was and kind to people who made several enquiries to his mentor while walking around the show. Tibetan Mastiffs, Summer and Enora, had a stream of visitors too. Jai Karan Mann, the owner, explained, “I have seven of them, I only like Tibetan Mastiffs for they are so majestic.” Back at his farm in the outskirts of Amritsar, each has an AC room and a sprawling pool to share! 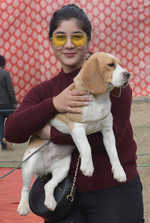 The Dog Show attracted some 40 breeds and 100 participants, says Sikander Singh, general secretary, Royal Kennel Club, Panchkula, “The dog show is going to be an annual feature,” he shared.